You have added Charm School Capsleeve Lace and Chiffon Dress in Bright Yellow into shopping cart. FINAL SALE. You'll feel effortlessly charming in this pretty lace and chiffon capsleeve dress. The Charm School Capsleeve Lace and Chiffon Dress is fully lined, except at the sleeves, which are semi-sheer. It has a subtle V neckline, cap sleeves, and an empire waist. The top is made of floral lace. The attached skirt has a flowy cut and is made of chiffon. An exposed back zipper completes this dress. The Charm School Capsleeve Lace and Chiffon Dress is perfect for almost any event. Pair it with beige pumps or wedges and you're out the door! Details: Fully lined except at sleeves. Exposed back zipper. 100% polyester. Contrast: 70% cotton, 30% polyester. Lining: 100% polyester. Dry clean only. Small measurements: Length from top of shoulder to hemline: 34". Bust: 32". You have added Charm School Capsleeve Lace and Chiffon Dress in Bright Yellow into Wishlist. You have added Charm School Capsleeve Lace and Chiffon Dress in Bright Yellow for Stock Notification. 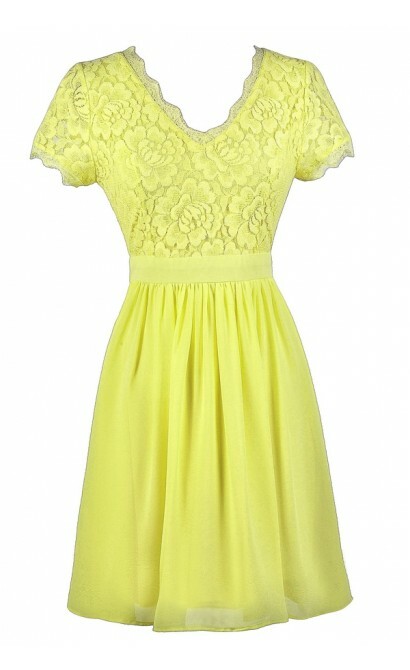 You have set Charm School Capsleeve Lace and Chiffon Dress in Bright Yellow as a loved product. 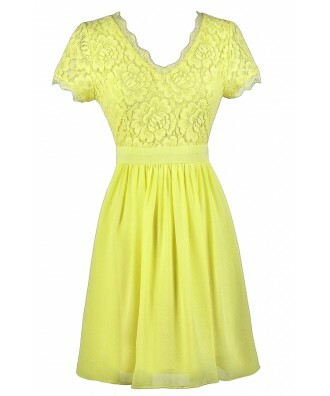 You have removed Charm School Capsleeve Lace and Chiffon Dress in Bright Yellow as a loved product.